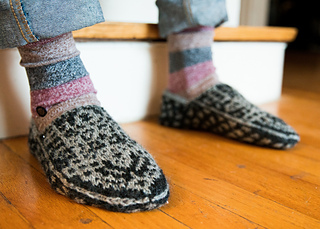 Norwegian motif men’s slippers are fun to make, fun to wear, and fun to give away. A fairly fast knit—in the round with double-pointed needles and single piece construction, Peder Slippers are perfect for chilly nights or frosty mornings. 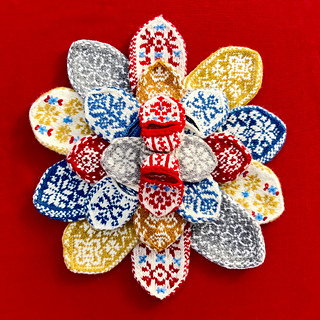 They feature 2-color stranded knitting, double-point knitting in the round, back and forth knit and purl work, and a crocheted edge. Knit with Raumagarn. Super happy for fall or winter nights by the fire with a cozy mug. 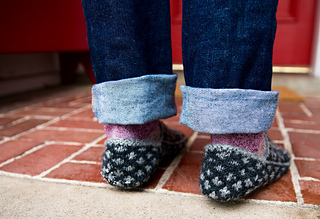 The eleventh pair of slippers in a series of twelve now available as an eBook.